Make a plan: There’s very little that can be done without some sort of planning. Hosting a Friendsgiving get together is no different. 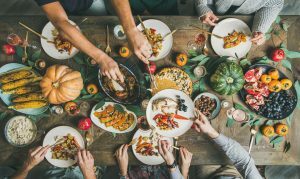 Find out who’s available and when (a bonus of Friendsgiving is that it doesn’t have to be held in November. You can schedule it whenever, even in December) and how you’d like to celebrate. Set a theme/menu: The genius of Friendsgiving is that it lends easily to a potluck format. As host, you should handle the main entrée since it’s no fun trying to transport a cooked turkey and gravy! Let everyone sign up to bring additional side dishes or desserts and drinks. A Google Doc or other shared spreadsheet is a great way to keep track of who’s bringing what. Or you can skip the traditional Thanksgiving feast for a fun Thanksgiving-themed cocktail party, turning your holiday favorites into bite-sized appetizers or order takeout. Feel free to get creative! Don’t sweat the details: Don’t stress yourself out trying to create an Instagram-worthy tablescape. Your friends will still have an enjoyable time. Instead, keep the décor simple with some candles, some small pumpkins or gourds, and play some music. Have some fun: After dinner, gather together and play some card or board games. Or you can have a holiday-themed movie playing in the background; just keep the volume low so people can still chat. Don’t forget the leftovers: As with any feast, there’s bound to be leftovers, so have some to-go containers at the ready so everyone can load up before heading out. Likewise, make sure to have plenty of aluminum foil on hand so people can cover their dish so they can easily bring them home. During this season of gratefulness, Friendsgiving is a great way to appreciate the special people in our lives. With a great group of friends, delicious food, and a welcoming atmosphere, this could be the start of a new annual tradition.